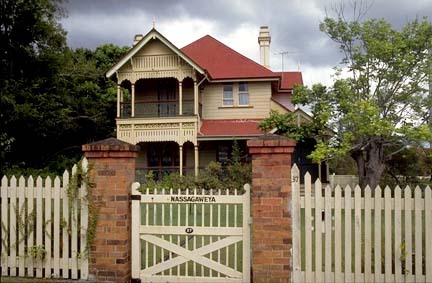 West End is an inner-city suburb on the southern side of the river, and it is one of the oldest in Brisbane. In the next few posts, we are going to look at a collection of its fine old homes, starting with this architect's own residence. 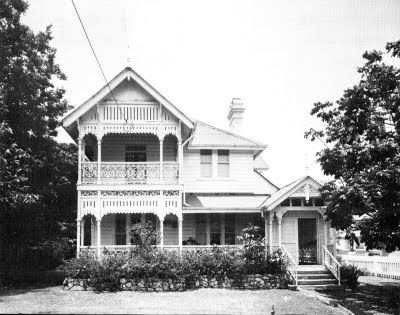 Arthur Morry was an architect in Brisbane in the later years of the nineteenth century. He subsequently became the mayor of South Brisbane and then a member of the state parliament. It is reported that Morry designed the Brisbane Synagogue, although that is not known for certain. Morry was certainly the supervising architect for the construction of the temple. 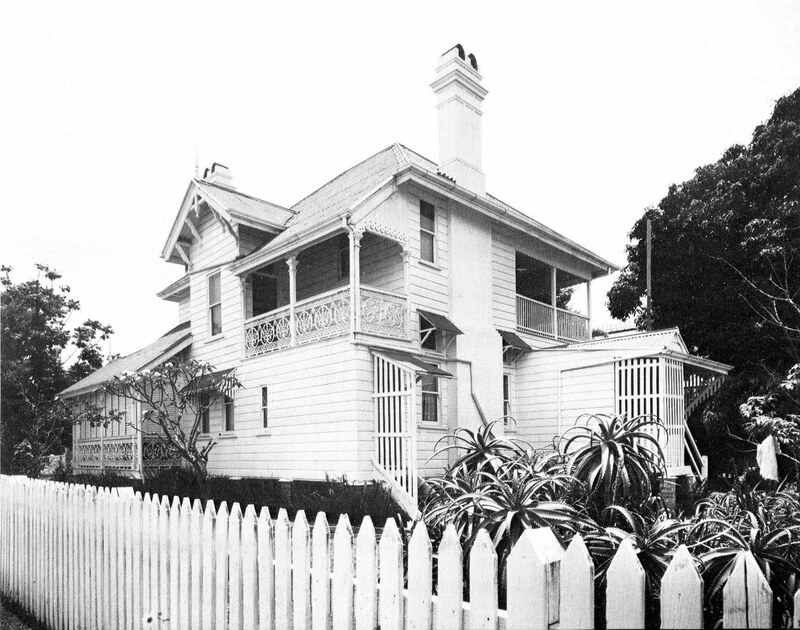 Morry designed his own West End residence around 1885 and lived there until 1895. It still stands, and here is a photograph of it from 1996. I'd be flat out describing this house, other than saying that it is unique. It is a mixture of gables and verandahs, still in remarkable condition, at least externally. These are my recent pictures of the house. The house is positioned on a corner block in West End, and it hasn't changed in the 30-odd years since the top photo. The name of the house, Nassagaweya, is proudly painted on the front gate. Nassagaweya is a town in Ontario, Canada, and this name was given to the residence by a subsequent owner, John Gillies, who named it after his birthplace. Gillies passed away in 1946, and I understand that his descendents remain in the house. Lucky them - it looks like fun! When my boys were little, we told them that Nassagaeya was the Gingerbread's mans house and Somerville house in the next suburb over was the Candyman's house. They believed those fun little lies for a few years as I remember. Ah I walk past this place all the time and I LOVE it! Me and my daughter often talk about what it would be like to live there. One thing's for sure. There would be gin and tonics on the verandah for me. Deffo. Katherine: It's funny how houses can captivate kids. I could imagine playing hide and seek in this one. Cara: "deffo"? - you total Aussie! :-) Although maybe the G&T is a give away!